Classes at Woodbury Grammar are at the state average but not overcrowded. Based on early attendance figures, enrollment in Cannon County schools is on the rise system wide. A total of 2,122 students were enrolled in Cannon County schools at the end of the 2009-10 school year, but according to preliminary attendance reports more than 2,200 were enrolled this year – as of Aug. 12. Though enrollment is up across the board, Cannon County schools are not overcrowded, according to Director of Schools Barbara Parker. Because of budget restrictions classrooms inside the seven schools that comprise the Cannon County schools system are full; however, they are not overcrowded and the student-teacher ratio falls in line with numbers mandated by the state board of education. Every public local school system shall have as a policy that pupil-teacher ratios should not exceed the averages prescribed by the general assembly. 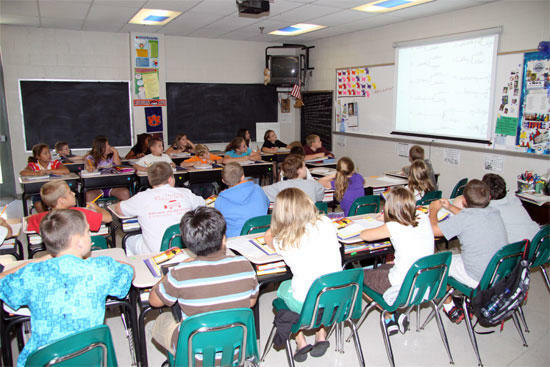 In grades K-3, for example, the average must be 20 and the maximum class size 25; in grades 4-6 the class average is 25 with the maximum class size at 30; and grades 7-12 the average is 30 with a maximum class size of 35. Because of the state of the current economy and the state-mandated requirements for class averages, class sizes at some Cannon County schools may be larger than in past years but that does not signal a problem with over-crowding, Parker explained. As it is; however, the system already is using $750,000 out of reserves to balance this year’s budget. “We have to work to make sure we are doing what is economically sound,” Parker said. Because of the increased numbers in Cannon County schools, Parker has had to spend the previous three weeks doing number crunching, making difficult decisions and adding or moving teachers. Two growth positions had to be added at Woodland Elementary and another seventh-eighth grade teacher had to be added at West Side in order to maintain the state-mandated average, Parker said. At Woodland, there were 41 students in kindergarten, 47 in first grade, 41 in second grade and 45 in third grade. Because the average of K-3 at Woodland was more than 20 students per class, an additional teacher had to be added. The situation was similar at West Side, where there were 36 seventh graders and 35 in eighth grade. Because the average was 35.5 an additional teacher had to be added. The two growth positions added had to come out of reserve funds because they were not in the initial budget approved for the 2010-11 school year. Parker said accepting a small number of out-of-county zone transfers did not prompt the additional teachers or growth positions. She also pointed out that there were only a few requests for out-of-county transfers and there also were situations that saw in-county students wanting to transfer to another school outside of their zone. “It could be a situation where it’s more convenient or on the way to work, or the parent works closer to a particular school than the one in their zone,” Parker said. In some cases transfer requests were honored inside the county but there were no out-of-county transfers granted into West Side or Woodbury Grammar due to their current enrollment. Students outside the county requesting zone exemptions could be placed at Auburntown, East Side and Short Mountain, along with Cannon County High School, in some instances. Parker said out-of-county tuition is $800 for one child and there is a $1,000 family maximum. Hardships are not considered. Why not merge Short Mountain and East side ? would save on utilities and Maintenance ,cafeteria staffing andteachers! Why not build a new High School, combine all the elementary schools K thru 5 and put them in the Woodbury Grammar School and then put 6th thru 8th in the old High School. That would save a ton of money, lower the student per teacher ratio, improve test scores and help our sports program and help the students work together a lot faster than the current system! Why not leave alone? Closing a school will not solve a problem if growth continues and there is overcrowding. lucydog, Short Mtn nor East Side could accommodate that number of students if the schools were combined. There's simply not enough classrooms. Remember, the smaller schools have very good scores...why mess up something that works? Rezoning is an option, in my opinion.